Wh's right in the fracking debate? What’s the Straight Dope on fracking? People on the left say it poisons everything for miles around and can’t be done safely. People on the right say it allows access to cheap domestic fuel and can reduce or even eliminate our dependence on foreign oil. —Jeff Grippe, White Plains, N.Y.
Every so often, the world presents us with little IQ tests revealing our ability to think rationally in the face of ideology, emotion and other distractions. The recent debt-ceiling debate, for example—let’s say I didn’t see a good argument for why we survived and not the Neanderthals. Now, the test case is energy. One wants to be optimistic, but dolphins, take note: There’s a chance that spot as Earth’s intelligent apex predator may soon open up. Background: Most oil and gas extracted till now has been found in porous rock, which allows for relatively easy harvesting. However, large reservoirs of petrochemicals remain behind, trapped in rock as impermeable as brick or concrete. Several technologies have been developed to get at these “tight and unconventional” reserves. The first is directional drilling, where you start drilling a well vertically, then turn the bit horizontal and bore sideways to free gas and oil that are difficult to reach from directly overhead. The second is rock fracturing, which breaks up rock to allow trapped oil and gas to escape. Rock fracturing isn’t new—as far back as 1860 nitroglycerine was being detonated in oil wells to good effect—but the current method, using hydraulic fluid under high pressure, is more efficient. That’s fracking. •Toxic chemicals. Fracking fluid is mostly water plus fine sand (used for wedging open the cracks created), but also may contain various friction reducers, disinfectants, surfactants, acids and corrosion preventers. Some of these chemicals, such as benzene, are carcinogenic, some are otherwise harmful to people or the environment, and some—well, a 2011 congressional investigation found fracking companies had been using tens of millions of gallons of fluid containing chemical ingredients considered proprietary by the suppliers. To put it another way, drillers were injecting vast quantities of stuff into the ground without even knowing what it was. •Water consumption. An analysis of 15,000 fracking wells in the Barnett Shale region of Texas found they consume about a tenth as much water as Dallas. Overall, fracking consumes less than 1 percent of Texas pumpage, but the Southwest has limited water resources—things could get pretty dry. •Contamination. 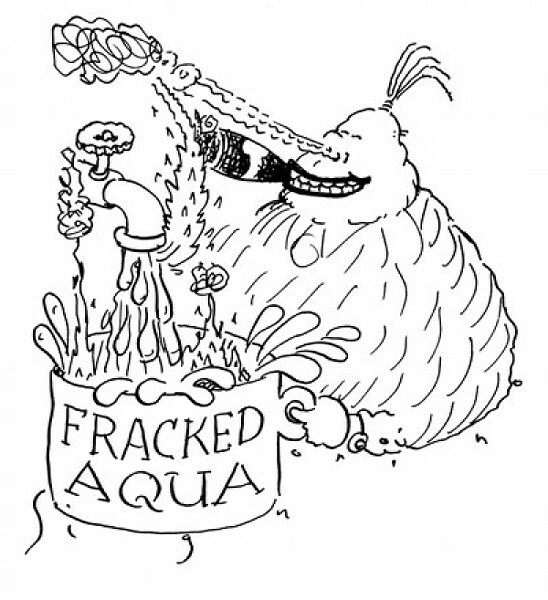 Some injected water returns to the surface, carrying with it brine and other pollutants that could leak into aquifers and water wells. A possible related problem is methane migrating into places where it shouldn’t, giving rise to such disquieting phenomena (check out YouTube) as flammable tap water. •Earthquakes. Some claim fracking sites are prone to them; others scoff. I don’t dismiss these concerns. Nonetheless, the environmental cost of fracking so far seems controllable and beats alternatives like coal. 1. By my rough calculations, the point at which world fossil-fuel extraction will peak, and thereafter decline, will occur around 2100. That’s a while from now, certainly much further out than I feared before the dimensions of the fracking boom became apparent. Nonetheless, it’s within the lifetime of people now alive. 2. Fossil fuels account for the vast majority of global energy consumption. Absent suitable replacements by 2100, our descendants are, not to put too fine a point on it, fucked. 3. The idea that alternative energy sources such as wind, solar, etc., are an adequate substitute for fossil fuels is a fantasy. As MIT professor Daniel Nocera has shown, even if all known alternative resources plus nuclear power (see below) are tapped to their practical limits, and current fossil-fuel consumption stays constant, we’ll barely have enough juice to provide the world’s billions with (on average) a Poland-level lifestyle by 2050. 4. Yes, nuclear power is one long-term energy source that hasn’t yet been maximized. But in Nocera’s analysis, just to keep up with expected demand over the next 40 years we’d have to open an additional nuclear power plant every two days. 5. Not going to happen, obviously. But the fracking boom plus the exploitation of other unconventional fossil-fuel resources such as Alberta’s tar sands may have bought us an additional 50 years. 6. That doesn’t mean we can blithely frack away with no thought to the future. The unfortunate lesson many will draw from the boom is that a solution to our problems will inevitably materialize. Nonsense. Setting aside the question of energy exhaustion, there’s this thing called global warming, to say nothing of the deadly pollution afflicting much of Asia. Point is, we have more time than we thought, but not much. If we invest it wisely, we may avert disaster. If not, and particularly if we pretend the solution is to somehow not use fossil fuels, as opposed to using them more efficiently while we transition to something else, see number 2 above. Send questions to Cecil via StraightDope.com or write him c/o Chicago Reader, 350 N. Orleans, Chicago 60654.